IGES is leading the NASA Earth Science Education Collaborative (NESEC) through a five-year cooperative agreement. NESEC is one of 27 projects selected in September 2015 by NASA’s Science Mission Directorate (SMD) as part of a competitive announcement. Click here to see a list of the 27 projects selected and introductory video. NESEC is a partnership between IGES and NASA Earth science divisions at three NASA Centers: Goddard Space Flight Center, Jet Propulsion Laboratory, and Langley Research Center. This cross-organization team is building pathways between NASA’s Earth-related STEM assets to large, diverse audiences in order to enhance STEM teaching, learning and opportunities for learners throughout their lifetimes.These STEM assets include subject matter experts (scientists, engineers, and education specialists), science and engineering content, and authentic participatory and experiential opportunities. 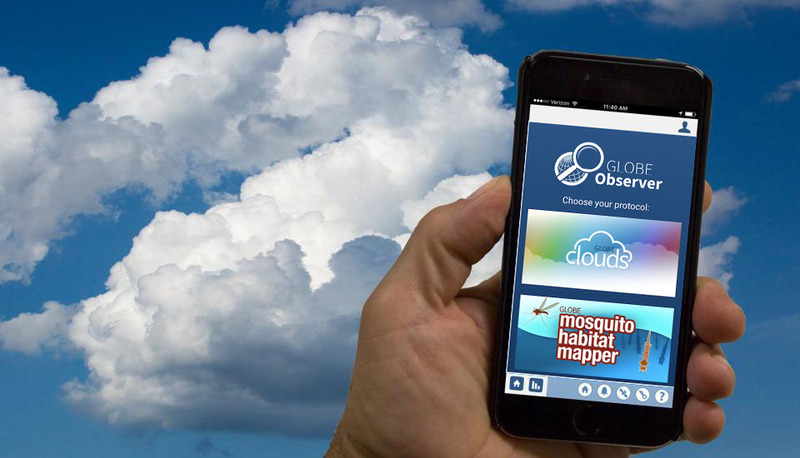 GLOBE Observer – Download the GLOBE Observer app and start contributing ground observations to NASA science related to clouds. Coming in 2017: Mosquito Mappers (mapping mosquito larvae) and Adopt-a-Pixel (mapping land cover).